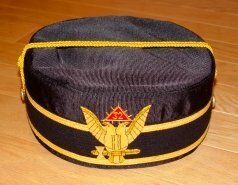 The first Scottish Rite organization among African-Americans was the African Grand Council of 1820 in Philadelphia, which was referred to as a Council of Princes of Jerusalem. This Council arose through West Indian migration, for Stephen Morin had propagated the Rite there. The Organization of the King David Supreme Council grew out of the conferring in Philadelphia (1850) of the 33rd Degree by Count DeSaint Laurent (also, Larine) of the Supreme Council of France and the Grand Commander of the Council of Spain on David Leary, the first Black Inspector-General of the Prince Hall Scottish Rite. In New York City, a Supreme Council of the United States was established in 1864. Also in 1864, a separate Supreme Council was formed in New York, which was made up of members from the National Compact Grand Lodge, from which a Southern Jurisdiction split off with the Headquarters in Baltimore, Maryland. From the Philadelphia Council, a Southern and Western Jurisdiction defected with Headquarters at Washington, D.C. In 1871 a fifth was established in Philadelphia, and was named King Fredrick Supreme Council. In 1881-1887, these five merged into 2 United Supreme Councils of the 33rd Degree: one for Northern Jurisdiction and one for Southern Jurisdiction. Ill. Edward M. Thomas petitioned the King David Council, since he was residing in the District of Columbia, for the 33rd degree to be conferred on representative Masons in D.C., and on May 5, 1856, the conferment was made and a council was established. A fourth council was set up in Baltimore, Maryland and a fifth Council in Philadelphia. These 5 Councils petitioned for unity in a conference in New York City on January 13, 1881, and was responsible for the Articles of Union and two Supreme Councils of the Northern Jurisdiction (PHA) and the United Supreme Council of the Southern Jurisdiction (PHA).